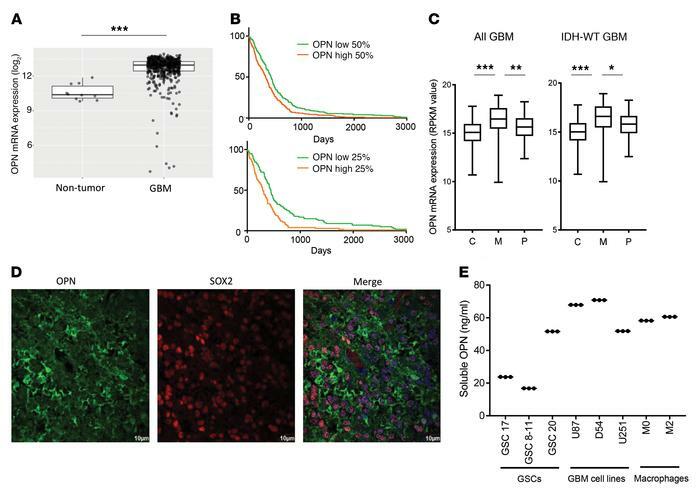 OPN expression is prognostic in human glioblastoma and associates with the mesenchymal subtype. (A) OPN expression is higher in GBM (n = 528) than in non-tumor brain tissue (n = 10, P = 0.000000067) based on TCGA data. (B) Kaplan-Meier survival estimates of glioblastoma patients in relation to expression levels of OPN in the tumors based on TCGA data sets. Median survival time: OPN high–expressing (50%) group, 318 days versus low-expressing (50%) group, 422 days (n = 403); OPN high–expressing (25%) group, 447 days versus low-expressing (25%) group, 296 days (n = 203). (C) OPN expression preferentially associates with the mesenchymal (M; n = 51) versus the classical (C; n = 59) or proneural (P; n = 46) GBM subtype (total n = 156; M vs. C: P = 7 × 10–6; M vs. P: P = 0.0043). A similar preferential association was found in IDH-WT GBM (n = 139): M (n = 48) vs. C (n = 56): P = 6 × 10–6; M vs. P (n = 35): P = 0.0459. In all GBMs (left), C: minimum (min) 10.68, 25% percentile 14.17, median 15.08, 75% percentile 15.95, maximum (max) 18.92; M: min 9.927, 25% percentile 15.46, median 16.54, 75% percentile 17.59, max 18.92; P: min 12.37, 25% percentile 14.71, median 15.64, 75% percentile 16.54, max 18.25. In IDH-WT GBMs (right), C: min 10.68, 25% percentile 14.13, median 15.02, 75% percentile 15.92, max 17.77; M: min 9.927, 25% percentile 15.45, median 16.59, 75% percentile 17.62, max 18.92; P: min 12.49, 25% percentile 14.88, median 15.81, 75% percentile 16.65, max 18.25. RPKM, reads per kilobase million. (D) Ex vivo human GBM immunofluorescently stained for expression of OPN (green) and glioma stem cells, denoted by SOX2 expression (red). Nuclei were stained with DAPI (blue) and the images merged, illustrating the prominent expression of OPN in the GBM tumor microenvironment. Original magnification, ×400 (scale bars: 10 μm). (E) Human GSCs, glioma cell lines, and macrophages were analyzed for production of OPN at 48 hours by ELISA (cells were seeded at 0.5 × 106/ml as a starting culture density). P values were calculated using the 2-tailed 2-sample t test. Data indicate mean ± SD and are representative of 3 independent experiments. ***P < 0.001, **P < 0.001, *P < 0.05.